The GTO was redesigned for 1966, although the styling remained similar. The rear saw the most change, with distinctive louvered tail lights. It became a separate model rather than a Tempest option. The engine choices remained unchanged, although a new "XS" option, which featured revised cam timing and air intake, became available, although the number sold was only about 185. 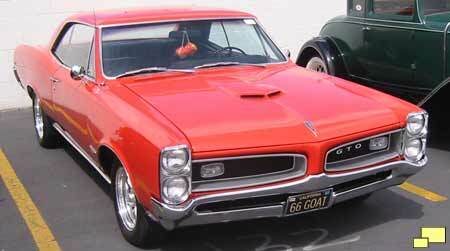 With 96,946 units sold, 1966 was the best sales year for the GTO. 389 3x2 bbl V8 0 to 60 mph . . . . 7.5 sec. 0 to 60 mph . . . . 6.8 sec. 0 to 100 mph . . . . 19.2 sec.